As of now, there are not enough Peace Zones or Peace Clubs established in the 5 Targeted States, Cities, LGA or Communities that have been affected by ‘violent conflict’ to sustain a Community based Peace Initiative. Peace Zones are Community based ‘safe places’ where the Communities gather daily to enjoy Basketball and Peace making activities. Peace Clubs are sensitizing ‘students’ about and for Peace and through their various ‘out-reach projects’ sensitizing their communities about the need for PEACEFUL Co-existence. Peace Zones are registering with their Local Government Areas, or States as NGOs and ‘co-operatives’ to initiate economically viable activities for success. The BB4P “Fund Raising Cards” gives each Peace Zone and Peace Club a means to acquire some funds for their activities. BB4P Peace Clubs have been recognized by the Plateau State Commissioner of Education to the extent that Peace Clubs have been made compulsory in all the Plateau State secondary schools. We believe every State should follow-suit. The name BB4P has attracted a lot of attention both in the media and the Basketball Community. If exploited to its full potential of having Bi-annual State and National BB4P ‘Competitions’ many more Youth stand to profit from their ‘sweat’. The most relevant factor about the Peace Zones as expressed by the “Founders” is the networking that should make every Peace Zone to compete against another Peace Zone, a minimum of once in every month. The BB4P Nigeria Network is now made-up of 5 States with requests from 6 more States to join. The BB4P Africa Network is yet to be formed but it is our desire to see it established in the near future because PEACE must reign and communities affected by violent conflict must find ways to heal. Our experiences thus far (4 years) have convinced us that a minimum of 3 BB4P Peace Zones each in 3 different Cities or Towns in each of the BB4P States are necessary for growth, development, sustainability and for the ‘message of PEACE to be spread continuously at the ‘grassroots’ level in the various violent prone Communities. Obviously, this will encourage more ‘buy-ins’ in these States and other States to join BB4P and establish their own Peace Zones. Already the Plateau State Commissioner of Education has made it compulsory for Peace Clubs to be formed in Schools in his State and BB4P is only having a presents in 2 Cities (Jos & Shendam/Yelwa). This is indeed another ‘testimony’ of the success of the BB4P Project and future possibilities. It is our belief that the Nigeria BB4P Network and the future African BB4P Network of Peace Zones when fully functional, with consistent Competitions will provide many opportunities for our African Youth to prosper while helping to bring and maintain PEACE in our ‘so called’ poverty, war-torn AFRICA. 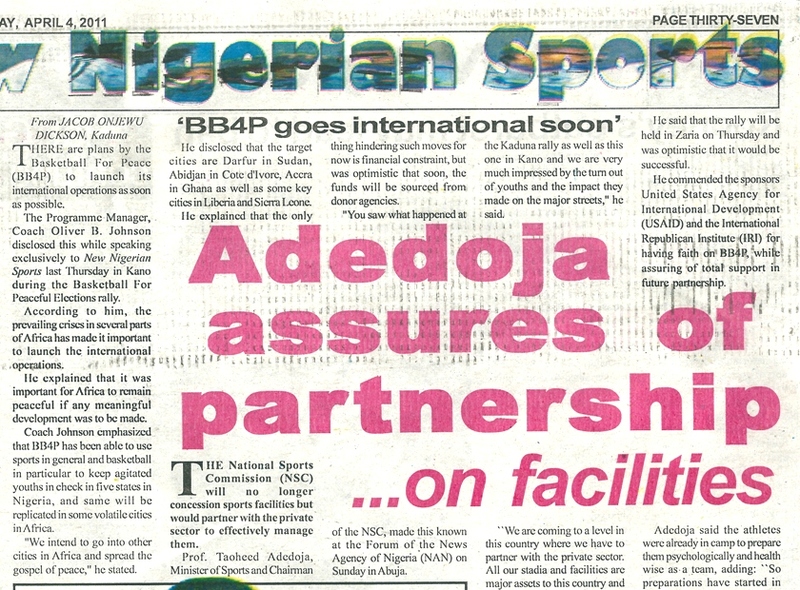 “BB4P goes international” (NNN Wed., Aug. 2006; pg. 23). “Almajiris Football League Underway” (NNN Wed. 20, Dec., 2006; pg. 30). “PEACE ZONES are not only solving CONFLICTS but also encouraging and bringing more development in BASKETBALL. The youths are happy and occupied with Basketball away from evil, trouble and hooliganism. The seating for players constructed by BB4P is another achievement, however, the message of peace is most important and should be preached to all NIGERIANS”. – Johnson Ochigbo. “I started to play Basketball in my secondary school and just fell in love with it. Later after finishing school, some friends invited me to be playing in our neighborhood playing ground, which I did and soon began to regularly go. I always knew I was doing well as a player, but it was not until BB4P program came that I realized my full potentials and how to keep working hard becuase of the competition around. As a basketball player I learned a lot from the program and got to meet many important people in basketball that I never knew. It also paved a way for me to be invited to the radar hoops camp and now I have been selected to join the festival camp team for my state. The BB4P program has given the opportunity to be on the path that I have always dreamt of which is to further improve my basketball skills with the hope of playing professional someday. I’m very thankful and glad I was opportune to be a part of the program. It was a great privilege for me . I look forward to participating in up coming BB4P programs.” – Harry Ezenibe. “For the message of PEACE to continue and penetrate deep into our communities BB4P need to give out more BB4P T-shirts, include more women and host, periodical PEACE AWARENESS CAMPAIGN at each PEACE ZONE” – Edward Tox. “The Y.M.C.A. is situated at the heart of one of the most volatile areas in Kaduna, where riots always take place but BB4P made Peace to reign in the area”. – Halidu Mohammed. “Coaches are having problems of bringing down the number of boys in each PEACE ZONE because everyday youth hear more about BB4P and they all want to join”. – BB4P Coaches. “The youth are looking forward to more from BB4P, but most importantly they have embraced PEACE in place of violence, they prefer to-talk-it-over instead of exchanging blows (fighting)”. – Aliku Saeed. “BB4P rings its bell and sings her songs of PEACE for Youth in areas of CONFLICT, so that they can resist being used to cause chaos in this country”. – Ademola Adigun. “All the PEACE ZONES are rehabilitated and fully utilized with more and more YOUTH turning up daily wishing to join BB4P ”. – Co-ordinators. “From the workshop, CONFLICT was defined as an opportunity for change or danger. Thus the need to control and manage CONFLICT so that only change occurs. Understanding this important fact provided all of us the opportunity to improve ourselves”. – Umar Bala. 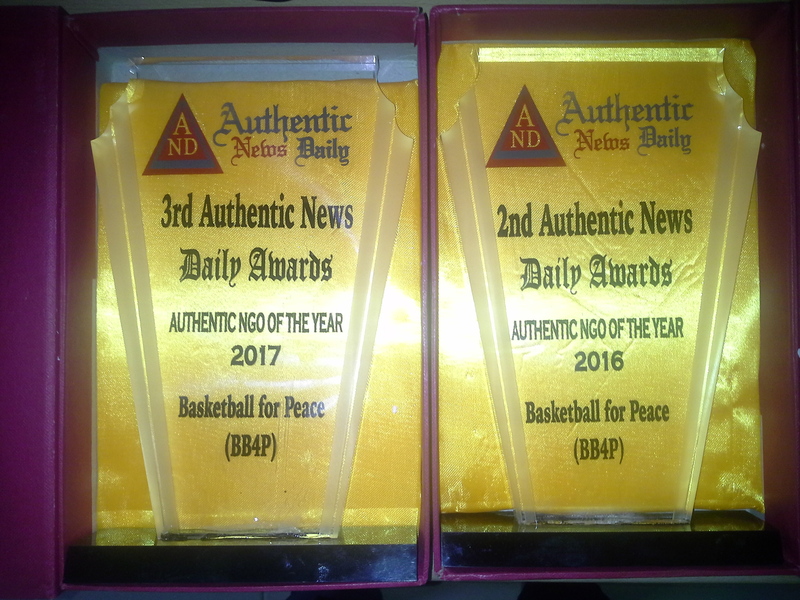 “For the first time I witnessed a PEACEFUL Basketball Match without players boxing themselves nor spectators causing commotion, the benefit of BB4P are unbelievable”. – Mustapha Gagari. “I have understood that ‘sports’ is not-a-do-or-die-affair, it’s not I must win by force affair e.t.c. Also I learnt how to accept defeat when I lose without causing CONFLICT and to enlighten my assistants, players and spectators not to cause CONFLICT by fighting or damaging properties”. – Sanusi Shuaibu. “BB4P is very much in line with the present administration’s resolve to bring about peaceful co-existence among the teeming youth in the state through sports” – Abdullahi Ibrahim (D.O.S., Kano). “The icing-on the cake was when BB4P providing playing shoes for the players. It was incredible, fans, spectators, and passersby who witnessed the event could only say one thing ALLAH YA SAKA, which means MAY GOD BLESS”. Umar I. Bala. “If BB4P is sustained in keeping with its present age group levels, it will not only avoid CONFLICT but would be desired to feed the NIGERIA age group National Teams”. – Tari Preh. “BB4P is a long awaited program for KANO, it has trained CHRISTIANS and MUSLIMS the spirit of Brotherhood and Anger Control. As a result our YOUTH have acquired more Basketball and Conflict Management Skills and have competed without crisis”. – Ado Ahmadu. “The youth were fully engaged throughout the program, potentials were identified, improvement of play and PEACE reigned. The credibility of BB4P is the understanding it made between players, coaches, spectators, and officials for PEACE” – Bala Uman. “All participants have understood that an unpeaceful atmosphere is an inhabitable atmosphere, therefore they are willing to be ambassadors of Peace, reflecting a spirit of sportsmanship, love, respect, tolerance and peace”. – Ola Gani. “Many players are proud to be part of the BB4P Program. After the games the Conflict Managers assembled both winning and losing teams and spectators to preach PEACE and drink Coke. This has made officiating easier”. – Bulus Audi. “BB4P changed everything, it was like a DAY DREAM, from poverty and a waste disposal area to billionaires. Everything had changed from old to new, new BASKETBALLS, a new standard size Basketball Court, Up-rights and rings changed the nature of the KANO, Zoo Road PEACE ZONE. New players and old ones that had left all came trooping back because of the BB4P Project”. – Mustapha Gagari. This peace zone is located along Bauchi Road. It is populated by Muslims. It was one of the most affected areas of the crisis and will be suitable for the peace programme. It is located in Jos North LGA of the State. This Peace Zone is located at YMC compound between Alheri and Rock Heaven metropolis. It is also a populated area of both religion and it is a very suitable area for the BB4P programme. It is also in Jos North LGA. This Peace Zone is located in Zang Commercial College area of Bukuru. It is also another venue that can be used for the BB4P programme due to the number of youth found around the neighborhood. It is located in Jos South LGC and consists of both Muslims and Christians. This peace Zone is located at First Gate, Azi Nyako Youth Centre, another venue for the BB4P it was one of the affected area in Jos South LGC of the State. Both religions are living any time. This peace zone is located at te Police Field Jenta Adamu. It is also suitable for the peace programme due to the number of youths found around that area and it is an area for both who are of both religions. It is also in Jos North. This peace zone is located at Police Barrack Training Field. It was also affected by the crisis and it is also a very suitable and populated place for the BB4P Programme. It is also an area of both religions and it is located in Jos North LGC.